Google Books is a pretty amazing virtual library filled with who knows how many books, magazines, periodicals, and whatever else you might expect to find in a brick and mortar library. Some of the books can be downloaded and saved as a PDF with just a click, others are restricted, but thats where Google Book Downloader comes in. Simply give the program a Google Book URL or Book ID, and Google Book Downloader will generate a PDF of that book (or at least the portion that is accessible via the web). This is so useful for anyone who wants a virtual copy of a book stored locally on their Mac (or iPod Touch, or iPhone, or even the iPad!). This is about as easy as it gets. 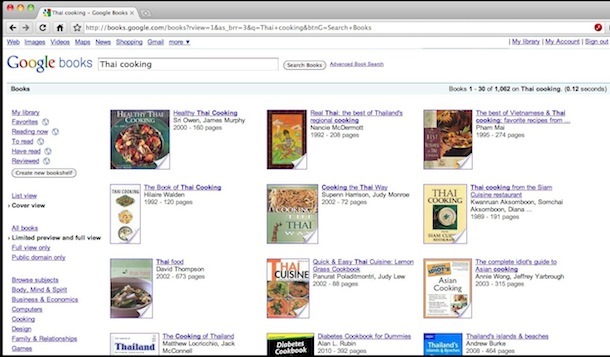 Your Google Book is now saved as a PDF and it can be read or viewed from anywhere, independent of the web and an internet connection. Awesome! Google Book Downloader is free and open source, so if you feel like poking around the code it’s freely available on the developers site. Thanks a lot! Saved my day! 1. Open your Internet Explorer (Not Firefox). Make sure that you are the admin of your computer. Then, go to the page in books.google.com that you want to download. 2. Now, go to “C:\Documents and Settings\%your admin name%\Local Settings\Temporary Internet Files\” of your computer. Delete all of the content of that folder. 3. In your Internet Explorer, refresh the page and browse-thru the pages of the books that you want to download. 4. Refresh the “Temporary Internet Files” folder. Copy all PNG files to another folder. You can distinguish PNG Files through its icon. These files that you have just copied are, actually, the pages of the books that you have just browsed. I can not find the folder: Temporary Internet Files. How do I do? Hey, this is awesome! Thank you so much! I’m able to download Mac Life magazines (which, of course, I rightfully own in print form). When I looked for something like this, I could only find PC applications to do this. is anyone else’s PDF/JPGs coming out all checkerboarded and unreadable? Did you ever get a solution to the unreadable checkerboard problem? I’m having the same issue? It downloads but not all the pages, only 3 or 4 pages out of 133..
Download the DRM removal plugin. Follow these steps carefully, as performing them wrong could lead to the installation of malware.